Bees are instrumental to plant and human survival, and they are worthy of our protection. Bee populations have been in decline due to loss of natural habitat and use of pesticides (both residential and agricultural). While their numbers are plummeting, each of us has the power to help restore their populations. Why should we care? Because 1 in every 3 bites of food we eat depends upon a bee for pollination. And the flowers in our gardens need bees in order to reproduce. And because they are just so darn cute!! Most of us are familiar with the honeybee, but many don’t know that the honeybee is a non-native species, having been brought here by humans from Europe in the early 1600’s. Considered a “social” bee, honeybees create communal hives and provide agricultural value, and of course, Honey! But as pollinators, they can not compete with the prowess of our native bees. They are known to travel up to 3 miles in search of food. Every other bee besides a honeybee that we find in North America is native to our continent. This includes the “social” bumblebees that create communal nests as well as all the “solitary” bees: mason bees, leafcutter bees, sweat bees and carpenter bees that live in the ground or in crevices in rocks, trees of fences. It is these native bees that are the super pollinators and workhorses in our gardens, orchards and farmlands. They are said to be two to three times more effective as pollinators than honeybees. Their territory can be as small as a 300 foot radius from their home base and many prefer plant diversity. While they will feed on non-native plants, it’s our New England native plants that provide the important early spring food sources that are so vital to their survival. So far, scientists have identified and catalogued 4,000 bee species! About 45 of these are the “bombus” species, better known as the Bumblebee. New Hampshire is home to about 16 species of bumblebees. Bumblebees may be the most recognizable type of bee in our gardens. Usually large, fuzzy and fat, with contrasting black and yellow coloring, they are absolutely fascinating to observe and provide us with months of entertainment. They rarely sting and only use this as a defense mechanism if they feel threatened. I can be mere inches from bumblebees in my planting beds, and never feel at risk of being stung. They are more interested in collecting pollen and nectar and usually pay me no attention. Of all the native bees in our garden, I have to admit that Bombus (bumblebees) are my favorite. They work non-stop from sun up to sun down, from early May until mid November, and do not discriminate when it comes to plants, providing they can land or wiggle their way to the pollen and nectar. The video was taken on September 21st, a time in the garden when many plants have stopped blooming. The Japanese Anemone becomes a hub of activity as you can hear from all the buzzing going on. In addition to their in-flight buzzing, bumblebees make a special vibrating sound to help knock the pollen off of the plant’s stigma. Anemone is an important plant, not only for long-lasting fall color in the garden, but also as a vital food source for pollinators! The non-bumblebee species that we see in our gardens are “locals” and lead unassuming lives, going about their important business of pollination and reproduction. These “solitary” bees do not hive, are docile, and rarely sting. Some species don’t even have stingers! Many don’t even look like bees. In fact, the Mason Bee, which we host in our garden, looks more like a small fly. While we have many that use our wooden bee houses for nesting, most find their homes in the crevices of our stone walls, fences and other quiet, out of the way places. Mason bees are fascinating to watch as the female selects a tube in the house, then begins the days-long process of depositing one egg at a time and sealing it off from the others in its own cell with a wall of mud (hence, the name “mason bee”. These “cells” house the egg along with “bee bread” which is a mixture of pollen and a sticky substance that she secretes. The first eggs that she lays deep within the tube are pollinated, so these become females. The eggs in cells closer to the front are not pollinated, and become the males. Our garden contains early blooming food sources like fothergilla, marsh marigold and hellebores. if you must remove dandelions, pull them out by hand and do not spray with pesticides as this means sure death for the bees! refrain from aggressively cleaning your garden beds in fall and early spring to minimize disturbance of over-wintering Queen bees. Wait until temps are consistently above 50 degrees. 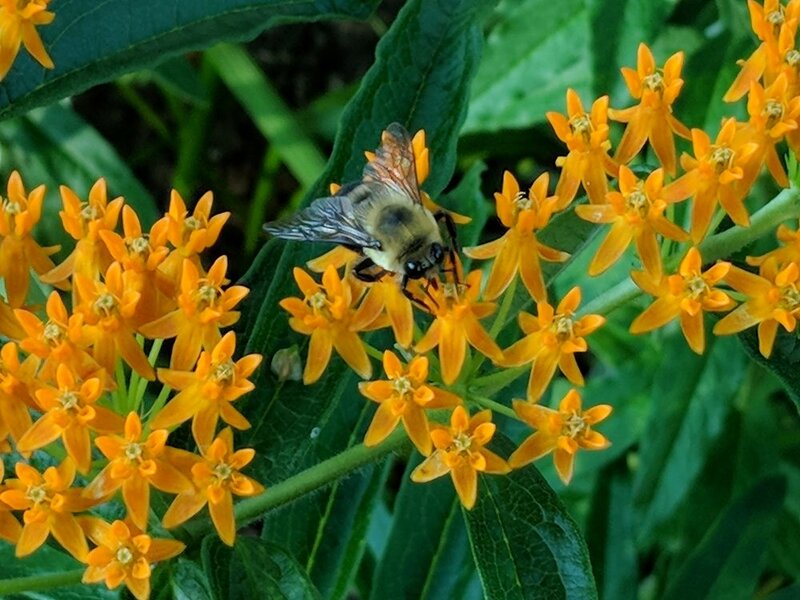 As Stewards of our Land, we can promote diversity of plants (including lawn weeds), which result in diversity of bees and other beneficial insects. In the early spring, bees are hungry after a long winter hibernating underground, and lawn weeds like dandelions are an ideal source of food and energy. Native bees are less fussy about where their meals come from (as compared to honeybees) and will visit any open bloom. Single petal formations like dandelion flowers offer the perfect landing pad for harvesting pollen and nectar.